As the U.S. starts to withdraw from Afghanistan, India’s military is stepping up with training for Afghans. Despite little or no prospect of stability in sight, the International Security Assistance Force (ISAF) is now starting to pack its bags for various destinations in Europe and the United States. It will leave behind the Hamid Karzai regime in a parlous state because it failed abjectly to militarily subdue the Taliban and its allies. Nor, for that matter, have the fitful attempts at negotiations with the Haqqani network proved any more fruitful. Finally, Pakistan, despite U.S. pleas, blandishments and occasional threats of an aid cutoff, remains as intransigent as ever. Against, this disturbing backdrop, India, the country that’s most likely to be adversely affected if a neo-Taliban regime returns to power, is finally taking a handful of decisive steps to protect its own security interests in the country. To that end, it concluded a strategic partnership with Afghanistan in October. Under the aegis of this partnership it has agreed to train company size (about 120) units of the Afghan forces. According to Indian sources, they will be trained in a number of military institutions including the Army War College in Mhow in Madhya Pradesh, the Counter-insurgency and Jungle Warfare School in Vairengte in Mizoram and the High Altitude Warfare School in Gulmarg, Kashmir. It’s also reported that India plans to supply the Afghan military rifles, rocket launchers and artillery. Finally, Afghan air force pilots will also be brought to India and allowed to train on flight simulators. The Indian decision to step up its security role in Afghanistan isn’t without its critics. Pakistan, quite predictably, has protested India’s limited foray into the security realm arguing that this will be inimical to Pakistan's security. Worse still, some Washington, DC-based analysts have also started to sound the same tocsin. Interestingly enough, the entirely expected Pakistani misgivings aside, those U.S. commentators who are so critical of the Indian role expansion have little to proffer in the way of alternative policy options. These criticisms notwithstanding, the very limited and circumspect – albeit belated – Indian offer to train and arm the Afghan military should actually be welcomed. If the world doesn’t wish to see the return of a religiously obscurantist, politically truculent and socially repressive regime in a post-ISAF Afghanistan, the Indian efforts to ensure a modicum of stability in this war-ravaged nation should be applauded. 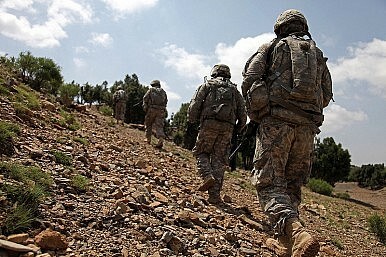 The Afghan president has laid out the conditions for an extended U.S. military presence. But with opposition to his rule growing, can Karzai hold on?